distribution Restricted to the southern Coastal Plain, north to Scotland, Hoke, Sampson, Onslow, and Carteret counties. However, as Paulson (2011) shows the range of this Southeastern species extending north to the Great Dismal Swamp, VA, area, it might occur elsewhere in the NC Coastal Plain north of the existing range. abundance Generally rare, but can be very locally abundant close to the coast. Found to be quite abundant at sites in New Hanover, Onslow, and Carteret counties in 2015 and 2016. Beaton (2007) also calls it "Rare to uncommon and local" in GA.
flight Beaton (2007) shows flight dates from mid-March to mid-November for GA, but adds: "Flight season is not fully understood, more readily found during April-May and September-October (especially fall) and largely absent during the middle of the season." Mark Shields found the species to occur in all months of the year at single pond sites in Carteret and Onslow counties, even in the winter months. Very few other odonates can be seen throughout the year. habitat Edges of lakes and ponds, including temporary ponds. May also occur at freshwater marshes. behavior According to Beaton (2007), males are usually found over water, perching on plants, while females can be found along the shoreline away from open water. comments This species clearly deserves some search efforts in North Carolina. 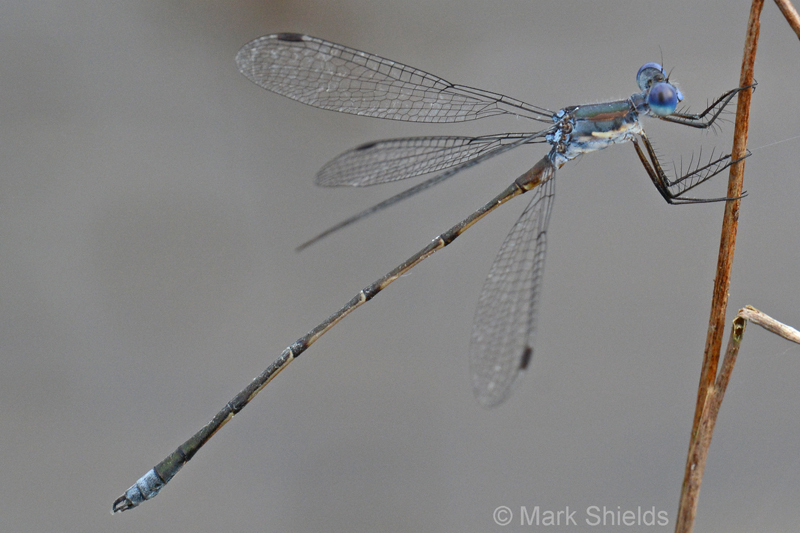 Until 2015, it was one of the most poorly-known damselflies in the state, as evidenced by only 12 known records from just six counties prior to that year. As a result, the NC Natural Heritage Program elevated the species from its Watch List to its Rare List in Fall 2012. Thankfully, Mark Shields has found the species to be much less rare than previously thought, and in 2018 the species was moved back to the Watch List. He found the species at clusters of pond sites in Onslow and Carteret counties throughout the year from late 2015 to late 2016, with several triple digit counts! In addition, he found it common in fall 2016 to late 2017 at several ponds in New Hanover County. Andrew Rapp photographed one in Brunswick County in 2016, as well. In 2017, Mark Shields and Hunter Phillips slightly extended the range west to Scotland County; this is our first record from the Sandhills region. Comment: Carteret, 2016-11-28, ponds along Patsy Pond Nature Trail, Croatan National Forest. Photo of mature female.